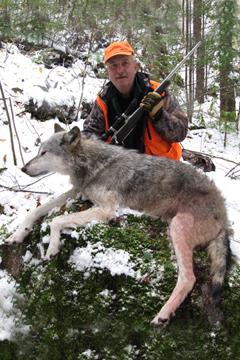 A timber wolf hunt is not for beginning hunters. It can require more stamina and patience than many other types of hunts. Wolves are particularly difficult to hunt, and to be successful you need to be the kind of hunter that enjoys the hunt as much or more than the kill. 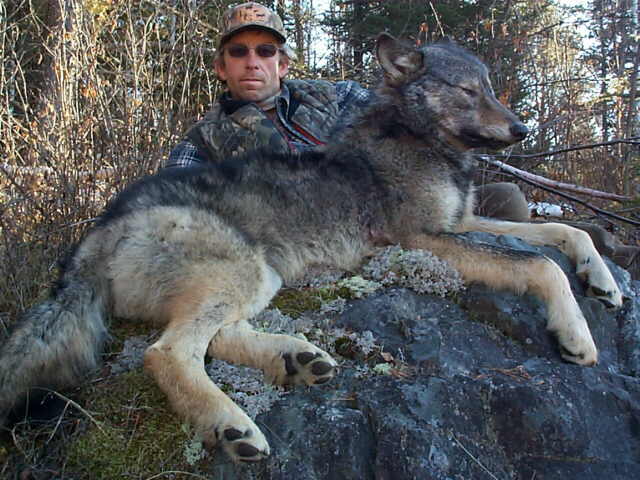 Wolf hunting offers a particular set of challenges that can be discouraging to some people. Wolves are extremely cautious, and simply prefer not to be seen. They hunt whitetail deer for a living, so they have to be like "ghosts". They are wily, cautious, and have incredible senses. There are many people that have lived in wolf country all their lives but have never seen a wolf. But that reflects only on the wolves' shyness. The wolf population here is excellent. In fact, we have wolves here like some U.S. states have coyotes. There are wolves that come right into our camp, and we often see the remains of their deer kills on Caliper Lake in the winter. Our guests are usually amazed at the wolf sign they see here. 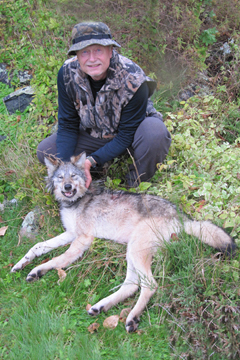 And the wolf season is open for a good portion of the year, which again speaks for the healthy wolf population. Wolves hunt a lot at night, so getting a crack at one during legal daylight hours can be difficult. However, it can be done, and unlike some other outfitters we do everything "by the book" - no night hunting. Wolves are territorial. Each pack occupies, hunts, and protects a certain area. Once you know where a pack lives, you can learn more about them, and that is the basis for our hunts. We know of many different packs, and try to get an idea of the timing of their hunting "loops". A pack seems to hunt a particular route, often returning to the same areas with remarkable regularity. Calling is helpful if the wolves are within earshot. Distressed deer calls work well, as deer are the wolves' primary food source. Also, howling can be effective. A wolf will almost always answer to a howl, regardless of their distance from the person howling. We hunt of out natural ground blinds made from deadfall. Sometimes when temperatures are extreme we utilize commercial popup blinds. However, it is always best to avoid this as the wolves can be skittish of commercial blinds. This of course reduces the hunter's chances of success. It is always best to dress for the conditions and hunt in the open. There are very few guarantees in hunting, but we do offer one - that you will find the wolf hunt a challenging and enjoyable experience in some of the most beautiful landscape you have seen. Your guides are avid hunters, and strive to provide the same hunting experience for you that they would want for themselves if they were on a guided hunt. Our lodge is a comfortable and friendly place to relax after an enjoyable day in the field, and we feed our guests very well! So while the outcome of the hunt is never a guarantee, the quality of the hunt experience is. And when you hear that first ghostly howl in the distance, you will know you are in timber wolf country, and you will be hooked! Wolf Only Hunt: September 15th through the 2nd Saturday in October. US$1450 per hunter. 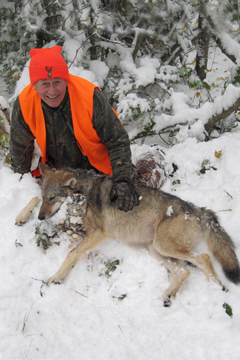 Wolf/Deer Combo Hunt: 2nd Saturday in October through end of October. US$2150 per hunter. A seven night stay (6 days of hunting). Private accommodations (cabin or motel unit) for your group. Three meals daily in our on site Bar & Grill. A bag lunch is prepared for those that prefer to remain in the field. Tracking and retrieval of game. A framed digital photograph of you with your trophy. Dressing of the game and preparation of the hide for your return home (NOT taxidermy). 50% of the hunt package price is due at the time of booking. 50% of the hunt package price is due 60 days prior to the hunt. Taxes and balance due to exchange are due upon completion of the hunt. All deposits are converted to CDN$ using the exchange rate current at time of receipt. On completion of the hunt the hunt cost is converted to CDN$ using the current exchange rate and taxes are calculated on that amount. Payments may be made in CDN or US funds. Fair exchange is given based on the current rate. All monies paid toward guided hunts are non-transferable and non-refundable. IMPORTANT: You must bring a hunting license in your name from your home state in order to purchase an Ontario hunting license. The license should be an old one that you no longer require, as you will need to surrender it to the issuer here. It must be an original license (no photocopies). If you do not bring this license, you will NOT be able to purchase your timber wolf license here.